Educated at Father Mazza's Institute in Verona, Italy, studying theology, medicine, and several languages. Ordained on 31 December 1854 in the diocese of Verona, Italy by Blessed John Nepomuk von Tschiderer. Missionary to modern Sudan in 1857, but returned home in 1859 due to ill health. Taught at Mazza's Institute 1861 to 1864. Wrote on the need for aid in Africa, that the aid should be used to "Save Africa Through Africa", treating Africans as adults in need of a hand, not children in need of guidance as was common in European thought of the day. Travelled to France, Spain, England, Germany, and Austria to on fund-raising missions. In 1867 at Verona, he founded the Istituto delle Missioni per la Nigrizia for priests and brothers, and the Istituto delle Pie Madri for women who were called to work in Africa; they became known as the Comboni Missionaries, and in 1894 became the Congregation of the Sons of the Sacred Heart. He opened similar institutions in Cairo, Egypt, to acclimatize missionaries to Central Africa. Wrote to the 1st Vatican Council in 1870 on the need for Church's involvement in African conversion. Pro-vicar Apostolic of Central Africa in 1872 covering Nubia, Egyptian Sudan, and the territory south to the Lakes (nearly 100,000,000 people). He founded missions in El-Obeid (Kordofan), Khartoum, Berber, Delen, and Malbes. Vicar Apostolic of Central Africa, titular bishop of Claudiopolis, and Bishop of Khartoum in 1877. He helped suppress the slave trade in the region. Contributed material for scientific works about the region, and of its geography; works on several dialects were based in large part on Daniel's notes about the languages. He spoke six European languages, Arabic, and several central African dialects. The Comboni Family continue their work today with priests, brothers and sisters ministering in hospitals, schools, and orphanages in 41 countries. Eldest daughter of Joseph and Josephine Truszkowski, Polish nobles. Well educated, Sophia was a pious, and lively youth with a frail constitution. She relocated to Warsaw, Poland in 1837, and attended the Academy of Madame Guerin. Due to respiratory illness, she and her tutor Anastasia moved to Switzerland in 1841 at age 16. On 26 June 1848, at age 23, she had a moment of extraordinary grace that she considered a conversion experience, and which led her to the religious life. Spiritual student of Capuchin Father Honorat Kozminski in 1854. Joined the Society of Saint Vincent de Paul in 1855 to help the poor, aged and homeless of Warsaw. Housed homeless children into her own home. In November 1854, she and her cousin Clothilde rented a two-room apartment at 10 Church Street, Nowe Miasto, in Warsaw. There homeless children spent their days in class and Mass, and then stayed the night; it was known as the Institute of Miss Truszkowska. Sophia prayed with the children at the Shrine of Saint Felix of Cantalice in a nearby Capuchin church. People call the kids the "children of Saint Felix" and the women the Sisters of Saint Felix, the Felicians. Thus was founded the Felician Sisters who are devoted to service to the poor, orphaned, sick and elderly. In 1855 Sophia and Clothilde become Franciscan tertiaries, Sophia taking the name Angela. She was forced to withdraw as its leader due to increasing deafness. Raised in a Christian family in North Africa. Priest, ordained by Saint Regulus. He and most other Christians in his area fled ahead of the Vandal persecutions; he and many other moved to the Tuscany region of Italy and lived as hermits. 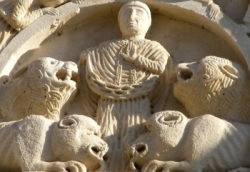 His reputation for holiness spread, and Cerbonius was chosen bishop of Populonia, Italy c.544; he soon became unpopular as he conducted Sunday Mass at dawn, forcing his flock to get up in the middle of the night. Pope Vigilius summoned him to Rome to answer the complaints. When he arrived, Cerbonius woke the pope at dawn for Mass; the two heard the singing of angels, Vigilius gave him permission to say Mass whenever he thought proper, and sent him home. For hiding Roman soldiers who were fleeing invading Ostrogoths, Cerbonius was ordered to be executed by being thrown to a bear. The bear was terrified of Cerbonius, fell to the ground and began licking the bishop's feet. Cerbonius was exiled to the island of Elba, Italy instead, where he spent the rest of his life as a prayerful hermit. • at Populonia there is a fountain and chapel dedicated to Saint Cerbonius; local lore says that "Whoever does not drink from the fountain of Saint Cerbonius is a thief or a rascal." The Venerable Bede describes him as a "tall man with a slight stoop, who had black hair, a thin face and a narrow, aquiline nose, his presence being venerable and awe-inspiring". Monk at the monastery of Saint Andrew, Rome, Italy. Missionary to the Anglo-Saxons in 601, sent by Pope Saint Gregory the Great. Worked with Saint Augustine of Canterbury, Saint Justus of Canterbury, and Saint Mellitus of Canterbury. Evangelized in Kent for 24 years. Bishop of York in 625. First missionary to Northumbria, converting thousands including King Saint Edwin in 627. When the pagan Mercians defeated Edwin's forces in 633, Paulinus retreated to Kent with the remaining royal family. Friend of Saint Ethelburgh of Kent. Bishop of Rochester. Studied at Oxford, England from age 17. Augustinian Canon Regular at age 19. Held several posts in Saint Mary's abbey in Bridlington, England. Reluctant prior of Saint Mary's for 17 years beginning in 1362. Highly recommended the study of the Gospel of Saint John as a source for information and inspiration on the Gospel life. King Henry V's victory at Agincourt was attributed to the aid of Saint John of Bridlington and Saint John of Beverly. Five sailors from Hartlepool were in danger of drowning, and called for the help of Saint John; the holy prior appeared to them at sea, wearing his habit. He led the men safely to shore. Persian noble raised as a Christian. When a Mazdean temple was destroyed, King Yezdigerd used it as an excuse to unleash a persecution of Christians. Arrested and tortured with Narses (sometimes Parses) and Sabutaka. The other two were then immediately executed, but Maharsapor was imprisoned for three years, regularly tortured. Repeatedly dragged before judge Hormisdavrus for interrogation, he was given chances to win his freedom by denouncing his faith; he always declined. The persecutions were continued in the reign of Varanes V, and Maharsapor was eventually thrown into a pit to starve. He was found dead three days later, kneeling, surrounded by light, apparently having died in prayer. Brother and sister, as children they were arrested for being Christians during the persecutions of Maximinian Herculeus. In court they admitted it and refused to renouce the faith. Martyr. 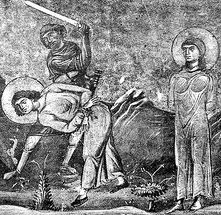 One of a group of nine martyrs who were murdered at the command of Emperor Maximian Herculeus. May have been part of the Theban Legion. Priest. Auxiliary bishop of Plock, Poland. Martyred in the Nazi persecutions. Relative of Saint Verena. Soldier. Leader of a cohort of the Theban Legion. Martyr. One of the Theban Martyrs. Priest in the archdiocese of Warsaw, Poland. Martyred in the Nazi persecutions. Imperial Roman soldier. Martyred with 290 other Christians on order of emperor Maximian for refusing to sacrifice to pagan gods to obtain victory in battle. Discalced Carmelite priest. Martyred in the Spanish Civil War. Layman. Soldier in a legion of Christian soldiers from Upper Egypt during the reign of Emperor Maximian Herculeus. The legion, as many as 6600 men, was massacred en masse by their own side when they refused to participate in pagan sacrifices prior to battle. Pilgrim from the British Isles who emigrated to Capua, Italy. He was such an obvious holy man and teacher that the locals demanded that he become their bishop. He served for eight years, fled the area during the Saracen invasion, served as best he could from Sicopli, Italy, and died in exile. Migrated to Spoleto, Italy in 1441. 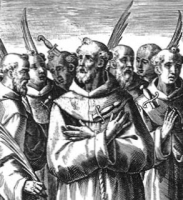 Franciscan tertiary. Spiritual student of Blessed Gregory of Spoleto. Prayerful hermit on Monte Luco for 50 years. Benedictine monk at Ferrières, France. Priest. Archbishop of Sens, France in 828. Bishop of Crete. His contemporaries considered him one of the greatest ecclesiastical writers of his time. Third century missionary to Armorica (in modern Brittany, France). Bishop of Nantes, France. Mercedarian friar. Theologian and teacher of theology. Cistercian Benedictine monk. Abbot at Pontigny in 1114. Bishop of Auxerre, France in 1137, the first Cistercian monk to become a bishop. Nun. Abbess of Jouarre Abbey, Meaux, France c.630 where she was a noted spiritual teacher of her sisters. Cistercian Benedictine monk. First prior of the Cistercian abbey at Las Junias, Portugal in 1135. Benedictine monk. Abbot at Fontenelle in France. Fifth century bishop in Scotland. Driven into exile by pagan Scots, he spent his latter years as a hermit on the Isle of Man. Young girl martyed defending her virginity. A group of seven Franciscan Friars Minor missionaries to Muslims in the Ceuta area of modern Morocco. Initially treated as madmen, within three weeks they were ordered to convert to Islam, and when they would not they were first abused in the streets, then arrested, tortured and executed. Martyrs.